Canfield, in 1798, became Township No. 1 in range No. 3 by the purchase from the Connecticut Land Company. This 16,324 acre tract was located on the southeastern border of the Connecticut Western Reserve Territory. It was purchased by six gentlemen; most of the land was owned by Judson Canfield. 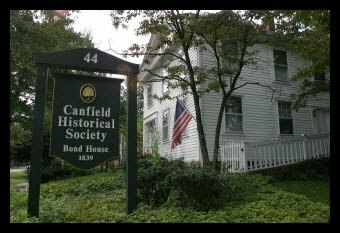 The Township was originally called Campfield; on April 15, 1800 it was voted to be called Canfield, in honor of Judson Canfield. Canfield's first settlers arrived shortly after surveying was initiated in 1798. Most of them came from Connecticut. Later, major immigrations were by the Germans in 1805, and in 1852 by the Irish Catholics. Goods were transported initially by horse and wagon from Pittsburgh. Later, trade was accomplished by horse and wagon to the Beaver Canal, the waterway which served the area and opened trade possibilities. Still later in the 1800's stagecoach service was established for mail and travelers. The first birth in Canfield was Royal Canfield Chidester, born June 22, 1802. The first burial was Oliver Chillenden, who died during childbirth on September 29, 1801. In 1801, the area's first business, a sawmill, was opened in the northwestern part of the township. Zalmon Fitch and Herman Canfield operated the first store. Mr. Fitch also operated the tavern. The first school was held in a community building that also served as a meeting hall and church. It opened January 1, 1801, and was taught by Caleb Palmer. Samuel Gilson earned six dollars every two weeks for walking from Canfield to Pittsburgh and back to deliver mail. By 1805, Canfield had approximately 17 homes, a store and a school; it became a trade center for the region. The Township's first election was held in 1803. Officers were appointed to govern and manage the township. Two of the officers were "Overseer of the Poor" and "Fence Viewer," a forerunner of today's Zoning Commission. A militia was organized following the state legislature's division of the state into military districts, during the legislative sessions of 1803-1804. Canfield was part of Trumbull County until 1846, when the counties in the area were redefined and Mahoning County emerged as a new county. Canfield made plans to be the county seat, and because of it being the geographical center it was made such in 1846, while Youngstown grumbled that it should have had that honor. 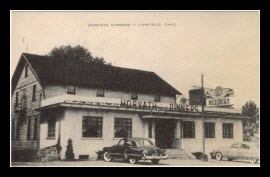 Thus a fierce issue was raised and it began a debate that would last three decades-that being which community would be the new county seat-Canfield or Youngstown. The bill for removal of the county seat from Canfield to Youngstown was voted upon by the legislature in Columbus in 1874. The House Speaker had to cast the deciding vote. Canfield challenged those proceedings on the basis of legality. The case was tried in Canfield and appealed to the Ohio Supreme Court, where the decision to make Youngstown the county seat was upheld. This took place in 1875. It should be noted that Canfield experienced a lot of growth during its tenure. Interestingly, Canfield was represented by General James A. Garfield who later became President of the United States. Things quieted down in Canfield following removal of the county seat. The hotel business died off and Canfield had less contact with the rest of the county. It became the center of a farming community. A popular social group during the early 1800's was the Onion Society, organized to "feast on the delicious vegetable." Feasts of meat, onions, (and a lot of liquor), were held. the Society was very popular and had a waiting list for membership. By the 1820s, several denominations had organized churches in the area. German Lutherans built a log church in 1810. The Methodists, Baptists, Episcopalians and Congregationalists followed. In 1828, many Baptists began to follow a new movement called the Campbellites Evangelistic Movement. This group believed all creeds were unnecessary and the word of the Bible alone was enough. They established a church in Canfield in 1830 which later became the Christian Church. Another stalwart church, established in the early 1800's and still active in the community, is the First Presbyterian Church. Jehovah's Witnesses have a Kingdom Hall and The Jubilee Christian Fellowship recently established their church in the township. The primary architectural style in Canfield, continuing today, is Classic Revival, a style that came to maturity in the Western Reserve region. This style became popular during Thomas Jefferson's presidency and was brought to this area by early settlers. Canfield's architectural style continues to be one of its greatest assets, still attracting new residents to the community. The Old Turner School was built in 1826. It was located on the east side of Turner Road, slightly north of Gibson Road. All school supplies, except paper, were homemade and supplied by students. The teacher was equipped with his books and a knife to sharpen pen quills. Discipline was rigid and punishment was inflicted which ranged from switchings to holding weights with arms extended. The Mahoning Academy was established in 1856, as a secondary school, by David Hine. It accepted students from the surrounding area, many of whom had to board with Canfield residents. The Academy was the literary, social and philosophical center of Canfield. 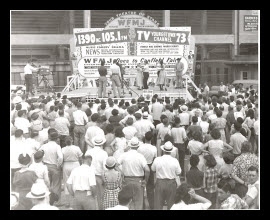 It promoted lectures, discussions and forums for the citizens. 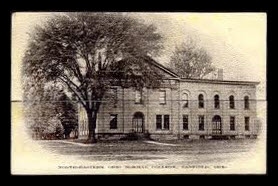 The Academy's Adelphic Union recorded its essays and poems, The Academy disbanded in the 1860's term of the Civil War; there weren't enough male students, and the remaining female students could not support keeping it open. The Northeastern Ohio Normal School was organized in 1881 in Canfield to meet the need for teacher training in the area. The school graduated many distinguished citizens. It closed in 1910 due to lack of funding. The Union School, Canfield's first graded school, was built in 1872. The first Canfield Fair was held on October 5, 1847 as a one day event with livestock tethered along Broad Street, produce displayed and meetings held in the Congregational Church. One hundred fifty dollars was earmarked for prizes. The sponsoring Mahoning County Agricultural Society made a profit from the fair of Three Hundred and Eight Dollars. In 1851, the fair moved to its present location on State Route 46. A fence was built around the property so admission could be charged. The first Junior Fair for boys and girls was held in 1853. By 1855, the number of exhibits and the number of attendants had grown so large that the fair was extended to three days. The fairgrounds were expanded in 1867. Its first superintendent was Mr. J.W. Canfield, Grandson of the City's Founder . The fair opened a new Main Hall (now the Floral and Fine Arts Building) in 1896 to commemorate its Golden Jubilee. The fairgrounds were first illuminated for night attendance in 1924. The fair is a popular attraction today, drawing hundreds of thousands of people from all over the country.